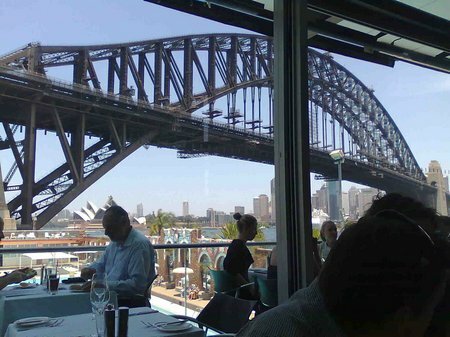 Two different dinners today, with the work Christmas lunch at Aqua at Milsons Point, with crazy perfect views of the Harbour Bridge. Very, very good food, where I get to indulge my fish love (without my fish allergic wife), and have prime Barramundi as the main course, along with a vege entree and an amazing chocolate cake as the desert. 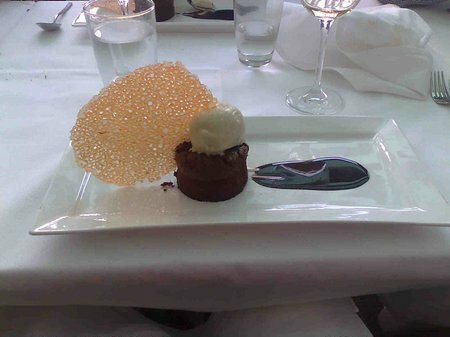 The desert… where presentation is nearly everything! The afternoon was a nice work gathering, as nice as any work gathering can be, with an amusing Kris Kringle swapping of parents (someone gave me a cut Spiderman dinner set that went straight to Will when I got home), and I gave a colleague something similar for their young child. Drinks, conversation that was rarely work related, and a great location and atmosphere. In the hot conditions, when we were done with that I jumped the right train to get back to Blacktown and pick up the kids, then headed to our hotel room. Got the glorious news that Sallie had spent the day finishing the packing and cleaning with Rachel, and later with Salllie’s parents down from Coona to help us out, so my ordeal would nearly be over. Then, I took the boys over to Blacktown Westpoint where we had dinner at the Hogsbreath Cafe with Sallie’s parents, grandparent and Uncle Wayne and his wife Roisie, and they young daughter Joselyn. Big family gathering, fun evening, nice food even though I didn’t eat heaps since I was full from lunch! I had some more work to finish, back at the old house after dinner, finishing it all off and taking one last load to the storage (where we picked up a second smaller space!) Finishing and finally closing off the old house at 11pm felt early compared to yesterday, and I enjoyed an hour at the hotel before sleep. Tomorrow, we hit the road!